Summertime is happenin' and I am SURROUNDED by ice cream stands. What is it about the middle of nowhere that leads to the proliferation of ice cream stands? So, of course, I now need to create a way to avoid all of those ice cream stands and I have done it! Check out the photo above - I know these look a little strange but they taste DIVINE. 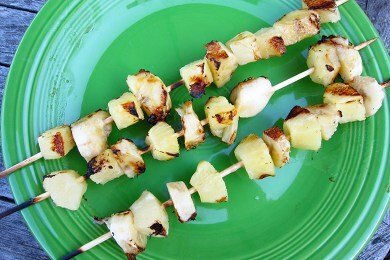 I'm talkin' about grilled pineapple and banana on a stick! Snack Girl has recently started a fetish about healthy food on a stick see: salad on a stick and healthy cake pop. I was concerned that it wouldn't work and that you would need to use fresh pineapple. It tasted great, though, it would taste even better with fresh pineapple, mango, and/or peach added to the skewer. I just don't have time to be cutting up all that fruit. You can sprinkle cinnamon on these skewers before you eat them if you like cinnamon. It does add a lot of flavor and I liked them even more with the cinnamon added. You can grill them with the other food you are cooking and then just serve them at the end of the meal. The heat caramelizes the banana so it gets super sweet and the pineapple is a great texture and taste contrast. These skewers would be fantastic for a party and, I hate to say it, amazing with ice cream. Have you tried to grill fruit on the BBQ? Please share. Drain pineapple and slice bananas into small pieces (the same size as the pineapple). Stick pieces onto skewers and place on a plate. Squeeze lemon juice over the sticks, cover, and store in refrigerator until ready to grill. Grill at medium heat, turning every 2 minutes until slightly charred (5-7 minutes). Dust with cinnamon and enjoy! Can be served hot or room temperature. I bet my kids would like these! You forgot the part about soaking the skewers. Try the Pampered Chef pineapple wedger. AMAZINGLY easy to cut up a fresh pineapple. If you like Mango, they have a Mango wedger too! love this idea, love frozen bananas too and you can put those on a stick to stay with the theme. If you want a frozen treat that's not ice cream, you can also put a banana on a stick and freeze it. If you want to add more flavor, you can dip it in dark chocolate or drizzle a little bit over it before you freeze. You can also buy those but it's easy to make them yourself too. i've grilled all sorts of fruit on the bbq! peaches, apricots, plums - stone fruits work great! also, apple slices will work for dessert or w/ pork kabobs! Grilled some fresh Pineapple for dessert for company last week-end. It was unbelievable!! Of course, my Pineapple had been marinated in Rum, and sprinkled with a little brown sugar....Makes me smile (and hungry) just thinking about it!!! If you soak the bamboo skewers for about 20 to 30 minutes before using them, it helps keep them from burning and smoking. How about having the skewers all ready to go? Just soak a bunch of them, lay them out on a cookie sheet, freeze them and store in freezer bag. When needed, just pull out some and start skewering. YUMM!! Can/t wait to grill some fruit. I make "ice cream" from banana (and/or other fruits). To do this you need a champion juicer. Just freeze bananas (and/or 2" chunks of any other fruit) and run it through the juicer. You get no juice because the fruit is frozen. Out of the nozzle where the pulp would ordinarily exude you get creamy pureed banana "ice cream". I mix in a little vanilla and make a carob sauce by mixing carob with rice milk. When I use other fruit it is not quite as creamy, but a more sorbet consistency. 100% whole fruit with no sweetener. Love love love this idea. I am totally doing this over the weekend. Thanks for the awesome idea. First timer here...can't wait to poke around some more. I already love what I see! Thanks for the inspiration! How bad is it, though, that throughout your post I just kept thinking about how delicious the skewers would be if... served with ice cream!?! Think about it in terms of discretionary calories. For the most part you want your calories to be nutrient rich in order to meet nutrient needs (fruits, vegetables, whole grains, low fat milk, fish, beans, lean meat). On top of that each person can eat foods that are high in fat and sugar. Those are called discretionary calories. They don't add much in the way of nutrients for the amount of calories they contain. Hi fat, hi sugar snacks such as ice cream, pizza, cookies, cakes, pastries, candy and soda are in this category. So it is better to choose them infrequently. If you add 1/2 cup of ice cream (about 150 calories) to the fruit skewer the total calories will be 235. This of course is all ball park. Discretionary calories for an average adult are 161. If you eat another snack that day or have a sugary beverage also, and do this regularly, at the end of the year you will most likely see weight gain. If you do this only occasionally its not going to matter. For children the average for discretionary calories is about 121. The caveat is if you are a heavy exerciser you might be burning those extra calories. These look so good. I will have to try it. Although I love skinny cow icecream. (I dump a bunch of cinnamon on the vinalla or 1 chocolate vita muffin with a tsp of whip cream and a ton of cinnamon. love this spice. Have a great day. I had got a desire to make my company, but I didn't have got enough amount of cash to do that. Thank heaven my close colleague said to take the loan. Hence I used the commercial loan and realized my desire. I LOVE grilled fruit! I enjoy it with Greek yogurt and a tablespoon of honey blended to get her than topped with the grilled fruit! The BEST dessert treat, I feel like I am cheating on WW and really it's only 4 points!! So far I have only grilled peaches, necterines, and bananas. Looking forward to more yummy fruits as summer nears! I love grilled bananas drizzled with a little honey just before you take them off the grill. I've done pineapple the same way, and the leftovers are great made into daiquiris!! !